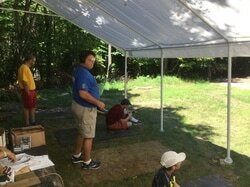 Oswegatchie Camp to Offer Hunter Education Course! In the earlier days of Oswegatchie programming, conservation skills including hunting, fishing, trapping, and forestry were common place activities in our program. As times changed and camper interested shifted. Oswegatchie changed many of its programs to be more physically active and reflective new innovative challenges like the ropes course. In an effort to offer new skills to our modern campers, Oswegatchie is offering the New York DEC's Hunter Education Programs during our 5 weeks of camp. Youth ages 12 and older are eligible to participate in the 10 hour course and additional firearms training. (Due to regulations, 11 year old youth can take the course, but they will not be able to fire a rifle). Throughout a regular week of camp, campers will still get to experience the ropes course, boats, bikes, and making new friends, but more of their daytime programming will be in a workshop setting. Trained Oswegatchie staff, professional high school agricultural educators, and DEC officers will train youth in what is required of them as responsible sportsmen in the 21st century. The course being taught at Oswegatchie does not require any homework before arriving, but we do suggest becoming familiar with some hunter safety material in advance which is viewable on the DEC Website at this link. For an online study guide to review in advance, go to http://www2.huntercourse.com/newyork/study . We do not need you to register with this site, but their study guide is done well and would be helpful in advance. Register for the Hunter Ed Class online before you show up for camp. To ensure availability, make sure you sign up in advance. It is a quick and easy way to hold a spot for your child and to sign the needed permission form for those students 15 and under. To complete online permission form, scroll down.